Over the past few months, President Trump has clashed with top officials — including outgoing Homeland Security Secretary Kirstjen Nielsen — over border security, urging them at different points to reinstate a stricter family separation policy, deny asylum seekers entry, and shut down the port of entry in El Paso, CNN's Jake Tapper reports. The bottom line: A senior administration official reportedly told CNN, "At the end of the day, the President refuses to understand that the Department of Homeland Security is constrained by the laws." 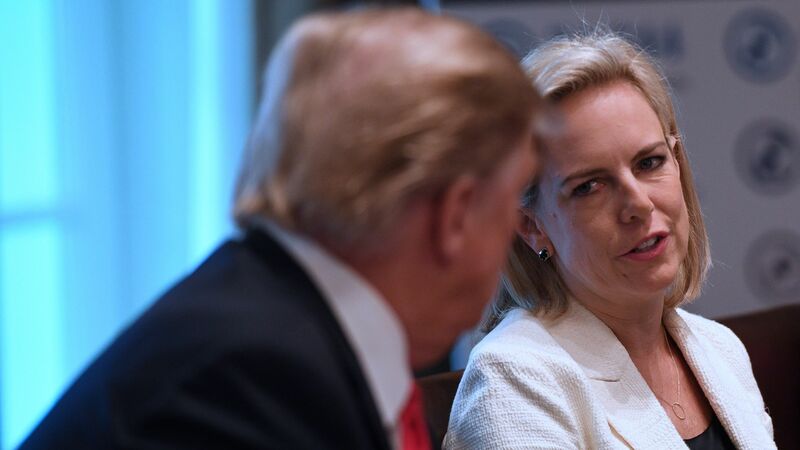 Details: Multiple sources told CNN that Trump pushed Nielsen to separate families, even those that entered through legal ports of entry and were legal asylum seekers, because he "thinks the separations work to deter migrants from coming." Trump reportedly told border agents not to let migrants into the country and to tell judges: "Sorry judge, I can't do it. We don't have room." He has repeatedly claimed that the U.S. is full and does not have room for more immigrants in recent tweets and speeches. On shutting the El Paso border, Trump was warned that it would inflict negative consequences on legal trade and travel, but told officials: "I don't care."